The protest against the construction freeze in settlements has reached Jerusalem: Some 15,000 right-wing activists protested Wednesday evening at Paris Square, near the Prime Minister's Residence. The demonstrators carried signs reading: "Break the freeze," and "No entrance for Bibi's freeze inspectors". The rightists are protesting the cabinet's decision to freeze construction in settlements for a period of 10 months. 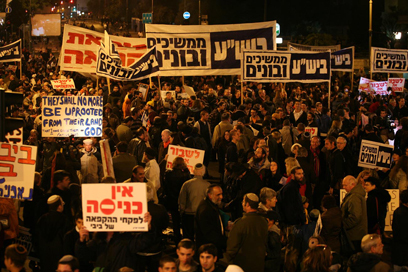 As part of their protest, the Yesha Council decided to hold a rally in Jerusalem on Wednesday under the banner: "Break the freeze". Yesha Council representatives, heads of local authorities, right-wing MKs and people who suffered financially as a result of the freeze are expected to speak at the demonstration. A number of MKs also attended the rally. National Union MK Arieh Eldad said at the protest, "Netanyahu says freeze, but he means disengagement. Jews are not popsicles, we cannot be frozen. Benjamin Netanyahu, the people of Israel are telling you today that we will not be frozen so quickly, we will not be beaten so quickly. Netanyahu says 'Yes' to a Palestinian state, and we say to him 'Enough'. We are giving a simple Zionist response to the freeze. This will be our miracle of rebellion – we will build everywhere, everywhere." Likud MK Tzipi Hotovely was also at the rally, and said: "The battle is over Jerusalem. When the European Union wishes to declare Jerusalem the capital of Palestine, it's not a struggle over Judea and Samaria, but over Jerusalem. "David Ben-Gurion declared Jerusalem the capital of Israel 60 years ago today. This is neither a battle over houses not construction, but over the Jewish people's moral right over the land of Israel. We promised our constituents that there was no distinction between Judea and Samaria and Jerusalem, we expect the prime minister to honor the reason he was voted for." She added, "The holiday of Hanukkah is near, and it s a holiday that sanctifies the struggle of few against many. Just as we are few against the world. Today, we say, 'Yes' to Jerusalem. 'Yes' to Judea and Samaria, and 'Yes' to the Jewish people's right over the land of Israel." Another Likud MK who spoke at the rally is Danny Danon, who said, "When the prime minister says freeze settlements, he is saying, 'You, the residents of Judea and Samaria – are the problem.' You are not the problem, you are pioneers, the Trumpeldors. The prime minister should tell President Obama, 'I will not compromise the lane of Israel'". Danon then gave the telephone number of the White House, and said, "I urge you to call President Obama and tell him 'Get your hands off the land of Israel, get your hands off the Jews that live in the land of Israel.'" National Union MK Michael Ben Ari said the message the rally sends must be clear: "Jews have been expelled enough times. If there are people that must go, if there are people that shouldn’t be here – it's not the Jews… This freeze is a tight noose and we will defrost it. This freeze is a poisonous pill for the people of Israel. "There will be no freeze," he vowed, "Not for 10 months, or two months, or two days or two minutes. This is our golden opportunity to teach Netanyahu, Obama, Sarkozy and the entire world – you cannot freeze the Jewish people." Shas' Nissim Zeev vowed to act as the prime minister's internal opposition: "Shas will do all within its power to see this revoked. The settlements are Israel's core. The challenge the settlement movement faces is to apply the historic right to live in Jerusalem and Judea and Samaria." Gershon Mesika, head of the Samaria Regional Council, said at the event, "Bibi (Netanyahu), I urge you, before it's too late, to take back this un-Zionist deed. Bibi, we will build the land with or without you. Bibi, remember that the land of Israel does not forgive those who harm it, as has been proven in distant and recent history." Yesha Council head Danny Dayan told Ynet, "So far, most of the struggle has been conducted in the settlements, in protest of the fact that a single Jewish house cannot be build between Afula and Arad and between Kfar Saba and Jordan." Of the decision to protest in Jerusalem, he said, "We have decided to bring the protest to the center of Jerusalem, near the prime minister's home. We are not here to ask for a compromise, the struggle will continue until the freeze is called off." Prior to the rally, Mesika said that "this crowd of thousands has spoken – we will overcome this racist ordinance that bars Jews from building their homes in the Land of Israel." Yesha Council's Pinchas Wallerstein added that "this kind of move cannot stand and I admit that after seeing this crowd I have new energy to fight this malicious freeze." Beit Aryeh Regional Council head Avi Naim: "This ordinance, as it has been worded, is anti-Jewish. It isn’t a democratic order and it infringes on basic rights. Where are the human rights groups now? This is our country, the land of the Jewish people. We shall on continue building it. the Land of Israel belongs to the Jewish people." Tsviki Bar Hai Head of Har Hevron Regional Council added that the settlers will never agree to the settlement freeze: "You cannot freeze the Land of Israel. Oslo (Accords) promised a 'new Middle East.' We said 'don't give them guns' and what did we get? Exploding busses and cafés. "(Ariel) Sharon promised security and displaced 10,000 people. We yelled – 'this will come back to haunt us' and what did we get? 'Hamastan' and rocket fire on Ashkelon… Our brothers in Tel Aviv – you must wake up. Heaven forbid you'll be next." Earlier Wednesday, Prime Minister Benjamin Netanyahu spoke about the rally in a meeting with Likud members, saying he was impressed by some of the party member's tenacity in fighting for the settlement movement. Nevertheless, he refused Likud MK Danny Danon's request to reexamine the decision. Earlier still, Police Commissioner Dudi Cohen said that freedom of speech and protest must be respected "to a point," adding that "The line is very clear and it stops in case of infringement on public order, symbols of government, public officials, soldiers and police officers." 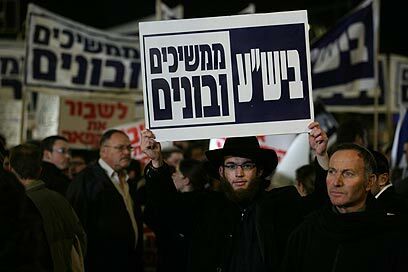 See all talkbacks "Rightists protest freeze in Jerusalem"